Urushi is made of tap of Urushi tree, which belongs to family of sumac tree; therefore, Urushi is a natural high-polymer compound, and natural resin of phenol family. The main component is oil, called "urushiol," but it has water and showing emulsification. Process of harden is similar to the harden of milk, drying and becoming semi-transparent film. However, Urushi has an enzyme, called 'lacquer", which absorb oxygen from water vapor in air for polymerization. The polymerization creates hard film (Urushi coat), under temperature-25 deg C with humidity-85% (most active condition of enzyme). 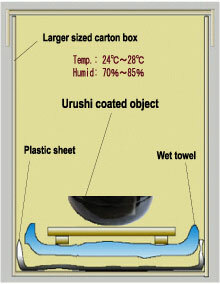 Unlike drying ordinary, Urushi requires humidity. The left is easy dry cell of Urushi, using corrugated box and wet towel. The drying time of urushi is approx. several hours to several 10 hours, depends on type of Urushi. Note: Do not touch with wet towel. Due to natural longer drying period, generally coating urushi takes approx. one month, but, it will take 3 months to create the typical harden Urushi coat. (Cashew Urushi coating takes usually one week to 10 days.). Urushi coat stands acids, alkalis, salt, alcohol as well as water-resistant, preservative from decay. Also, urushi coat is electric isolation. Urushi oil is refined 3 different type of Urushi paint family; one is raw urushi called "Ki-urushi" for base coat, mixing with "Tonoko" (polishing powder or stone powder) to make harden coating surface; other is transparent urushi, called "Suki-urushi" for mid or final coat, also mix with color pigments to create color urushi; last one is black color urushi, called "Kuro-urushi" for mid and final coat. 1. 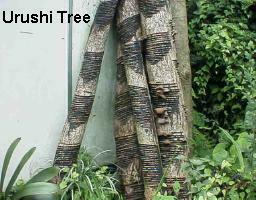 Cashew urushi does not have Sumac tree rash (eruption of skin), unlike Hon-urushi. 2. 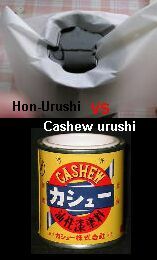 Cashew urushi has faster drying time than Hon-urushi. 3. Hon-urushi has more deep and tasty feeling. 4. Cashew urushi and Hon-urushi are weak against Ultra Violet of sunlight.